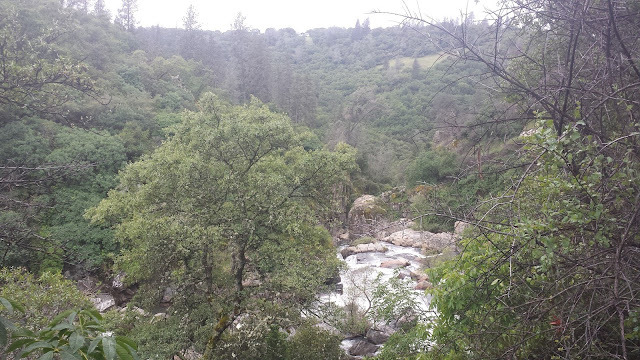 Living so close to the Lower Yuba has been a real tease this season. As soon as the river begins to come down Mother Nature decides to make it rain causing it to rise again. Hopefully as we approach May the weather will hold so we can gradually watch as the Lower Yuba reveals what its been hiding for the past few months. A few days ago I was recently struck with trout fever. I needed to wade and fish some cold moving water. With my sickness growing stronger every day, I began scanning through Google maps and the DFG regulations book for open water. This turned my attention to Deer Creek, Wolf Creek, and Squirrel Creek in Nevada county. These three creeks are smaller streams that are less subjected to experience high flows therefore they were viable fly fishing options. However there was one important dilemma, were they open to fish? Nevada County sits in an interesting area within the DFG district regulations. Both Sierra and Valley District regulations apply to Nevada County which can create confusion whereas to which waters are open and closed. Valley District "All streams except anadromous waters and those listed by name in the Special Regulations" are open all year. Sierra District "All other streams except those listed by name in the Special Regulations" are only open during general trout the Last Saturday of April through November 15th. Absolute clarification was needed if I wanted fish these water without getting ticketed. I found my answer in Chapter 3. Trout, Salmon and Special Regulations of the DFG regulations. Article 1 District Definitions 6.36 Valley District Defintion states that within Nevada County any area "west of Highway 49" is considered the Valley District. In 6.35 Sierra District Definition any area "east of Highway 49" is considered the Sierra District and is therefore closed until general trout season opens. To further prove this I used the DFG Regulation Map. I was in the clear to fish some new water. 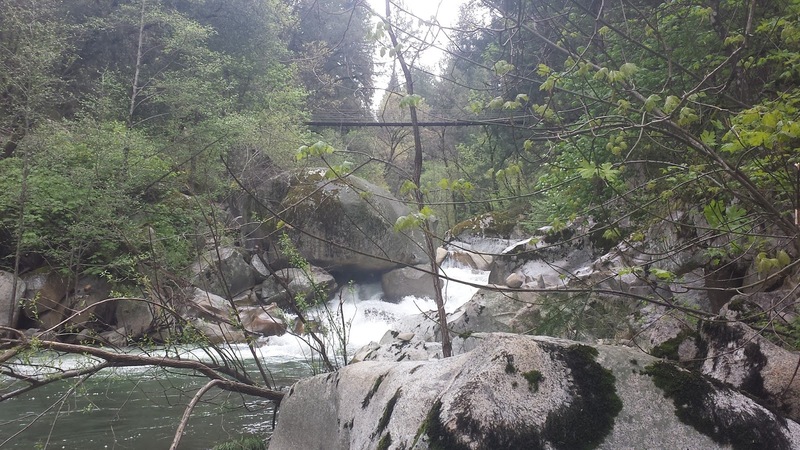 After reading an article about fishing Nevada County's three creeks, I set out the following morning to explore. My first stop was to check out Deer Creek below Lake Wildwood. I parked at a turnout and bushwhacked downhill until I saw the water. The creek was running high and the surrounding canyon-like terrain made it impossible to traverse safely. I admired the view for a few minutes, packed up, and left to my next destination. Squirrel Creek was the next closest stream. This small stream that is suppose to hold both rainbow and brown trout runs through Penn Valley and Rough and Ready. From what I could find on Google map there was only one access point that was on public land, the Western Gateway Recreation Park. This creek is a beautiful little stream surrounded by plenty of green vegetation and trout habitat such as undercut banks and submerged trees. Despite fishing all the fishy spots and finding tons of swimming mayflies, I was unable to connect to any fish. Perhaps if I waded downstream more towards the canyon I would have found a few trout but because of limited time I made the call to revisit Squirrel creek another day and explore Deer Creek. Deer Creek sits at a higher elevation in comparision to both Squirrel and Wolf Creek. Due to the elevation differences I knew that Deer Creek would be my best option if I wanted to catch a trout this day. 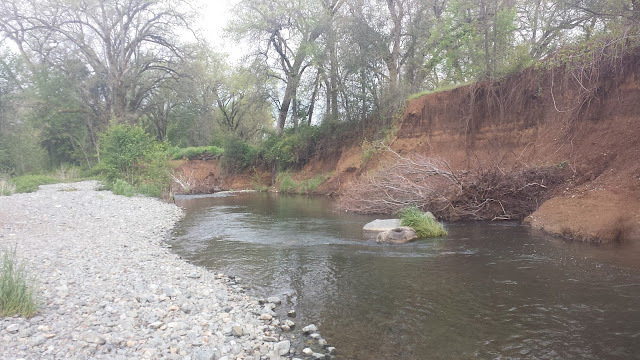 Unlike the other creeks, Deer Creek has plentiful access both close to the main roads and off the beaten path. Once I arrived at my destination I knew that this would be it. I grabbed my rod and hiked downhill. Deer Creek was running a bit high but was very fishable. I rigged on a few nymphs, some splitshots, an indicator, and began trying my luck. 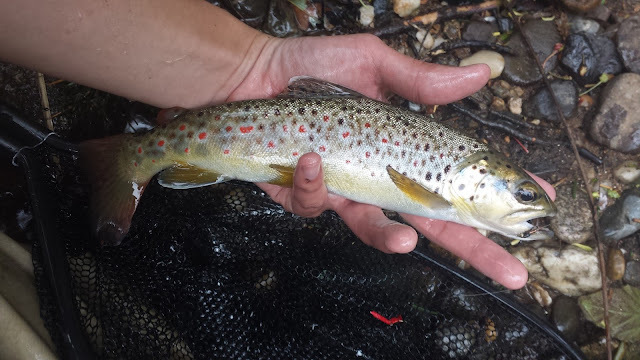 Within my first few casts, low and behold a nice little brown trout. Several brown trout and a few rainbows came out of that pool and made my day. Throughout my visit I continued to hike and explore the creek. I found many great spots and caught a few more along the way. What an amazing little stream, I can't wait to come back later in the year when the water is lower and the fish are on dries. I never made it to Wolf Creek but I will definitely try to get back up there soon. Nevada City is a beautiful area with the surroundings of a town that feels higher in elevation within the Sierra-Tahoe National Forest, it is amazing how much of a difference an hour drive from the valley can make. 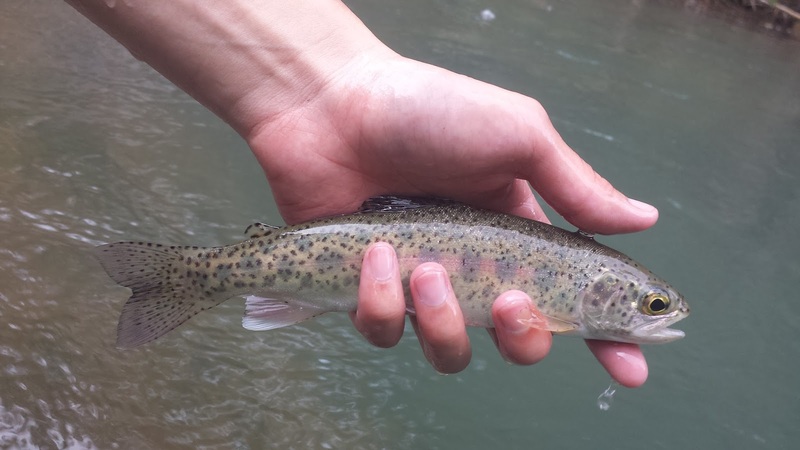 I will continue to explore new small waters within the area in hopes of catching a small stream fish truly worth bragging about.